History: Five months into this world and Sooki is already playing havoc. One recent Sunday evening, Sooki paid a visit to the Pet Emergency at Stafford. Her owners were concerned about a piece of thread that was hanging from her bottom. She had also vomited once and was showing some signs of abdominal pain. An x-ray was taken of her abdomen at the PET ER and what showed up was quite interesting. Sooki had swallowed a sewing needle attached to a long thread of cotton. The needle was lodged half way down her small intestine and the thread had made its way out her bottom. This can be life threatening as if the needle perforates through the intestine; a severe infection follows which can lead to death. Also, the bowel can concertina up as it keeps on trying to push the cotton thread through to the end of the intestines. This can lead to intestinal death as the blood supply is cut off. Needless to say- this was a life threatening situation. Sooki was placed on an IV drip at the PET ER and given some pain relief to make her more comfortable. She was sent straight back the next morning for surgery at Wilston Vet. Examination: Upon arrival, Dr. Meredith examined Sooki. 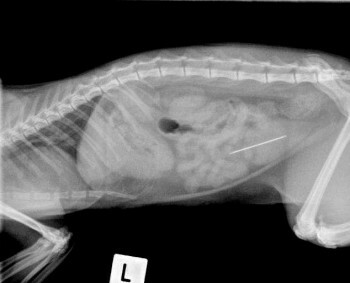 Dr Meredith took another x-ray to see how far the needle had moved since her visit to the PET ER a few hours earlier. Dr. Meredith was quiet concerned for it looked as if the needle had moved further down the intestines and may have even perforated the intestinal wall. Sooki was immediately anaesthetised and prepared for surgery. 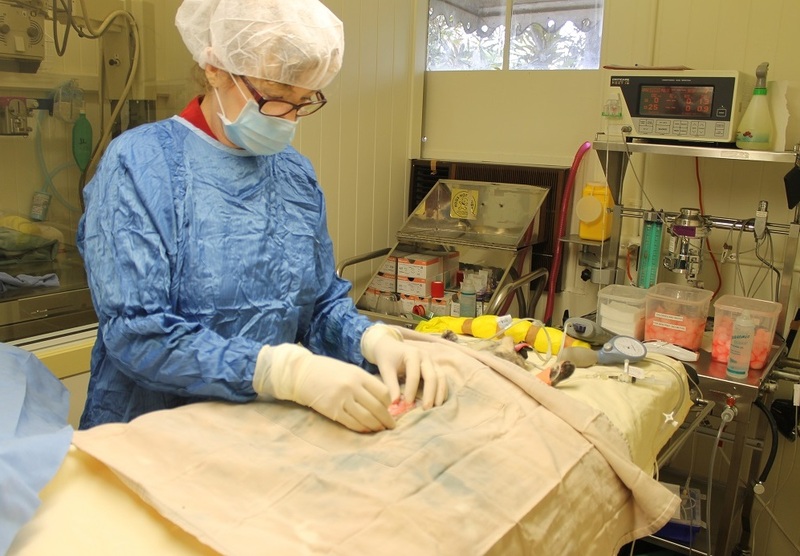 Treatment: Dr Meredith made a large incision into Sooki’s abdomen and the needle was found just starting to exit out of the small intestinal wall. 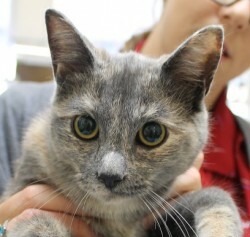 Sooki was so very lucky that the needle had not yet fully punctured the intestines so there was no evidence of any intestinal content leaking into her abdomen. Dr Meredith made a small incision in the intestines over the needle tip and carefully retrieved the needle. 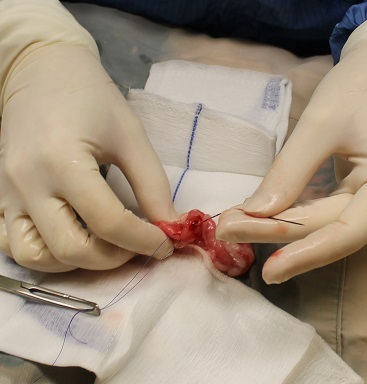 The thread, which was extending into her large intestine, was gently pulled though the faeces and intestinal contents and removed with the needle. 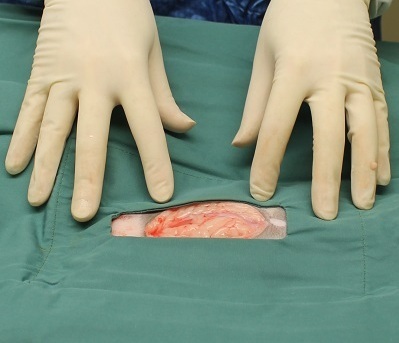 The intestines were closed with 2 layers of sutures to ensure there would be no leakage of intestinal contents into the abdomen. Warm sterile saline was used to flush out the abdomen to prevent any contamination from the faeces. High doses of broad spectrum antibiotics were also given to ensure there was no chance of infection following surgery. Dr. Meredith had to use several surgical kits and a number of sterile glove changes to maintain high sterility. Sooki’s anaesthetic was stable throughout, and for her post operative recovery, she was placed in a warm bed with a bear hugger (heater) to keep her core temperature stable. Once awake she was fed a high calorie food to try and get the bowel moving as soon as possible. One of the complications of bowel surgery is ileus (the bowels stop moving). This can be fatal so early feeding post operatively is very important to kick start the movement of the intestinal tract. Outcome: Sooki spent the night at Wilston Vet before being discharged the following night. Dr. Meredith’s main concern for the next few days was to ensure that Sooki was defecating and continuing to eat well……….which she did. Sooki made a full recovery and is back to doing what she does best…….getting up to mischief.